Think Eat Move Thrive – by Drs. James and Debra Rouse – offers simple advice for losing weight and getting healthy. The authors encourage their readers to stop focusing on quick fixes. Replace them with techniques for mindfulness and simple lifestyle practices that instantly help you feel better and promote lifelong health. Think Eat Move Thrive is a 30-day program that integrates mindfulness, intentional eating, and interval-based movement. It is based on science-supported medicine and healthy living research. The program is flexible and can be personalized for any lifestyle. It is simple to understand and easy to follow. You will be encouraged to identify the source of your attitudes and develop a clear intention. This will actively move you closer towards achieving your health and weight loss goals. Readers are guided through the process of cultivating mindfulness and empowering attitudes while shifting limiting beliefs and habits. Challenge yourself to move out of your comfort zone. Fill your life with optimists and people that inspire you. Be aware when you are in a negative mindset, then change it. Be consistent and act with integrity in everything you do. When performing any task be aware and fully present. When your neurotransmitters are balanced you feel happy, healthy, at peace, and focused. This occurs through a combination of the right mind-set and healthy lifestyle behaviors. Eating with intention fuels your mind for greater clarity and helps your body perform at its optimum. Make food choices that support your intention to be present in every moment. Emphasize your “primary foods” (things that feed your soul). Discover your eating personality and work out how to alter or support it so you can achieve your highest potential. Focus on plant-based and nutrient dense eating. Consider periodic cleansing with the change of the seasons. The authors recommend an anti-inflammatory diet – similar to the Okinawan and Mediterranean diets. Included is a 30-day meal plan, which averages around 1600-1800 calories. If you are an athlete, an active male or have a low body mass index you may need to increase your caloric intake. Physical activity is an integral part of a healthy lifestyle. A healthy, strong body will help you to complete meaningful goals in your life. Develop a positive body image. Judge your health by your thoughts, eating habits and exercise regime – not by your weight. Just because you are “normal” weight – or even underweight – doesn’t mean you are healthy. Exercise is not just for your body – it can also improve brain function and enhance your focus and mood. Take time throughout the day to fit in exercise wherever you can. Wild salmon, free-range chicken breast, grass-fed beef, buffalo, eggs, sweet potato, brown rice, oatmeal, quinoa, barley, red peppers, kale, eggplant, broccoli, cauliflower, spinach, asparagus, lettuce, celery, blueberries, cherries, raspberries, strawberries, pomegranate, cranberry, avocado, walnuts, hempseeds, flaxseed oil, olive oil, dark chocolate, red wine, green tea. The 30-day program includes exercise recommendations that are very time-efficient and generally require less than 20 minutes each day. These routines are based on interval training, strength exercises, cardiovascular fitness, and outdoor activities. Readers are encouraged to include yoga in their fitness schedule. Yoga can lengthen muscles, improve flexibility, produce mind-body benefits, and bring peace and calm to your life. 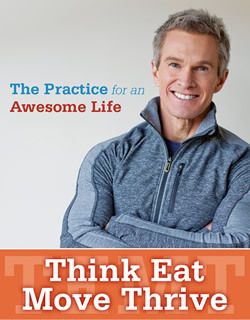 Think Eat Move Thrive: The Practice for an Awesome Life retails at $24. Focuses on improving health in a holistic sense instead of simply losing weight. Readers are encouraged to break out of their comfort zone – to try new things and different ways of thinking. Recommends consumption of a variety of fresh, unprocessed organic foods. The exercise regime has a lot of variety, which helps maintain interest and motivation. May require more time for meal planning and food preparation. Organic foods can be expensive. Some dieters may not enjoy all of the physical activities included in the 30-day program. This holistic approach is most likely to solidify the beneficial lifestyle changes required for long-term health and weight management.